First we’ll drive through Portage Valley, home to several hanging glaciers and beautiful alpine scenery. Depending on the season, we may be able to view salmon as they complete their lifecycle and spawn in one of the valley’s rivers. Then we’ll visit the Alaska Wildlife Conservation Center, which opened to the public in 1993, and has been providing up close and personal Alaska wildlife experiences ever since. It is located on 140 acres at the southern edge of Turnagain Arm and the entrance to Portage Valley. The Alaska Wildlife Conservation Center provides wildlife education and awareness, and care and rehabilitation for Alaska’s wildlife. Get close, safely observe and photograph some of Alaska's largest land animals, including moose, bison, elk, deer, caribou, bears, and musk ox. Our guests also enjoy seeing small mammals like lynx, and stunning birds of prey, such bald and golden eagles. 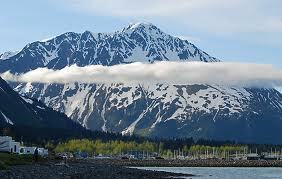 For lunch we’ll visit the quaint town of Girdwood and our favorite Bake Shop. Bottomless soup, sourdough bread, beverages, and dessert are all on the menu. After lunch, get ready for the aerial tram ride up the longest double black diamond ski slope in North America. From the top you can view several glaciers and the farthest northern reaches of a temperate rainforest that stretches from here all the way south to Northern California. On select days our guests visit the Roundhouse Museum. This mountainside museum features a panoramic viewing deck for incredible views. Next we’ll continue the scenic drive into Anchorage, along the Turnagain Arm, watching for wildlife and taking stops at scenic viewpoints. Upon arrival in Anchorage, between 2 and 3pm, you’ll be transferred to your hotel or the airport.